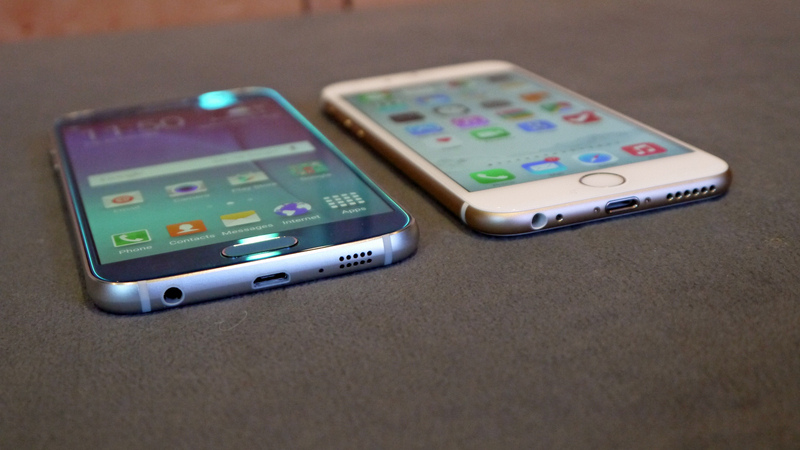 Iphone 6S vs Samsung Galaxy S6: Which phone should you Buy? The design of the iPhone 6 is simple and slender but made with strong metal, coming in at 7.1mm thick. The Galaxy S6 is actually a little slimmer, clocking in at 6.8mm thick and even though it is not a heavy/strong as the iPhone, it is certainly more stylish. Both are designed with absolute quality, as you would expect from both companies. The iPhone 6S is built with the an Apple A9 processor, which was created to be 70% faster at CPU tasks. The graphics are a whopping 90% faster than what the 8-bit chip had in the last model, so you can expect something undeniably special. The Samsung utilizes a processor which incorporates an octa-core Exynos processor and it also has exactly four cores which run exactly at 2.1 GHz. The Galaxy S6 may have the upper-hand in this particular competition simply because it was built with a more state-of-the-art system. The Iphone 6S display is a 4.7-inch 1334 x 750 IPS LCD screen which utilizes 326 pixels per inch. It is the same exact resolution as the iPhone 6, revealing that compact is still king. The Galaxy is a little bigger with a 5.1-inch 1440 x 2560 display and the density of the pixels runs at 577 per inch. The resolution is sharper and denser than the Apple, clearly taking this challenge away from the corporate giant. The iPhone is very well-regarded for its incorporation of stellar cameras and this new model is no different. It is integrated with a main camera which is 12MP and a front-facing camera that is 5MP, both being more improved than the last model. The Galaxy S6 is considered the selfie machine with it’s 120 wide-degree lens and it’s wonderfully incorporated 16MP rear camera. The Apple has this showdown all the way and the camera is something you just simply can’t take away from such a great company. The truth is, both of these fantastic phones are loaded with exceptional technology and they each have their very own special qualities. The only decision to make is to simply call it a draw, due to the fact that each model has specific qualities which different people will call essential. Either way you look at it, a purchase of either one of these smartphones should please the most discriminating smartphone owners.